Tuesday – AUS – Retail Sales fell 0.4% in December, which is the biggest decline since the previous December, and left the annual growth rate below the long-run average and steady at 2.8%. Tuesday – AUS – RBA Cash Rate Decision – The RBA left the cash rate on hold at 1.50%, as widely anticipated. The Australian sharemarket closed 1.9% higher yesterday, led by strong gains in the Financials sector, which ended the session up 4.5%. All sectors finished the day in the positive, with Health Care the exception. The big four banks were among the major improvers, following the release of the final report of the Royal Commission, which was released after market close on Monday. Westpac climbed 7.4%, ANZ lifted 6.5%, Commonwealth Bank gained 4.7% and NAB added 3.9%. In contrast, mortgage brokers were the major underperformers, after a recommendation was made to remove trailing commissions for new loans written after 1 July 2020. Australian Financial Group slumped 29.1%, while Mortgage Choice lost 25.2%. 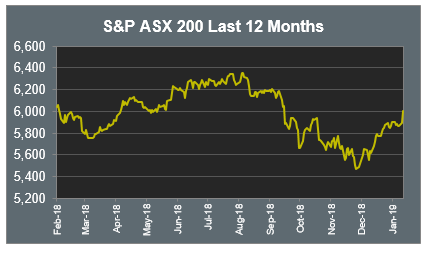 Mining stocks continue to remain well supported, with BHP and Rio Tinto closing up 1.1% and 3.0% respectively, as the iron ore price continues to strengthen, up over 15% in the past week. The Australian futures market points to a 0.42% rise today, driven by broadly stronger markets overnight. European sharemarkets were firmer on Tuesday, led by strong gains among Eurozone banks. Energy giant BP rose 5.2% after it revealed its profit doubled to US$12.7 billion in 2018. Apple supplier, AMS, lost 6.9% after announcing first quarter revenue will fall. The broad based STOXX Europe 600 rose 1.4% and the German DAX climbed 1.7%, while the UK FTSE 100 rose 2.0%. US sharemarkets also closed higher on Tuesday, as gains from Technology stocks outweighed a slump among Financials. Earnings and economic data was mixed, and trade was subdued ahead of the State of the Union address. Positive earnings results drove cosmetics maker Estée Lauder and luxury fashion group Ralph Lauren 11.7% and 8.4% higher respectively, while Alphabet fell 0.1% in reaction to its earnings result. By the close of trade, the Dow Jones and NASDAQ had both gained 0.7%, while the S&P 500 added 0.5%. 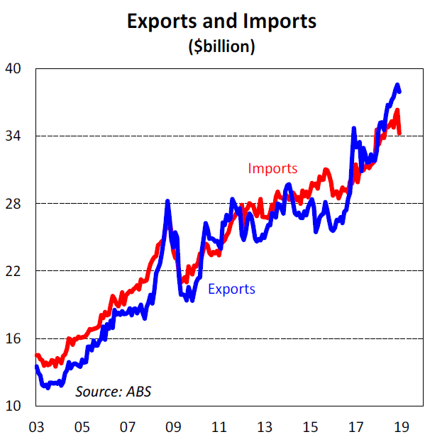 On the surface, yesterday’s trade surplus for December of $3.7bn, the largest in two years, sounds very impressive, but the improvement was largely attributed to a 5.7% plunge in imports. The weakness in imports adds to a variety of signs that domestic demand weakened towards the end of last year. The weakness was broad based, with sharp declines across some key domestic categories, as well as a drop in capital goods like machinery and industrial equipment. Commodity prices ensured the export side of things was relatively firm over the year, albeit a little weaker in December also. While the weaker demand is nothing new and unlikely to turn around any time soon, the growing risks in the global economy also raise the question of whether the pace of export growth will be sustained.